From start to finish, this ring is completely hand fabricated and truly a one of a kind custom ring. Rustic textured and hammered copper lightly oxidized to highlight every detail. Hypoallergenic Surgical Stainless Steel Lining. I take great pride in creating something so meaningful for you. It is substantial about 2.5mm thick, sturdy and made to last. *Please keep in mind, wider bands feel tighter than narrow bands of the same size. If you're in the US please order the Multisizer in my shop to ensure the best fit. 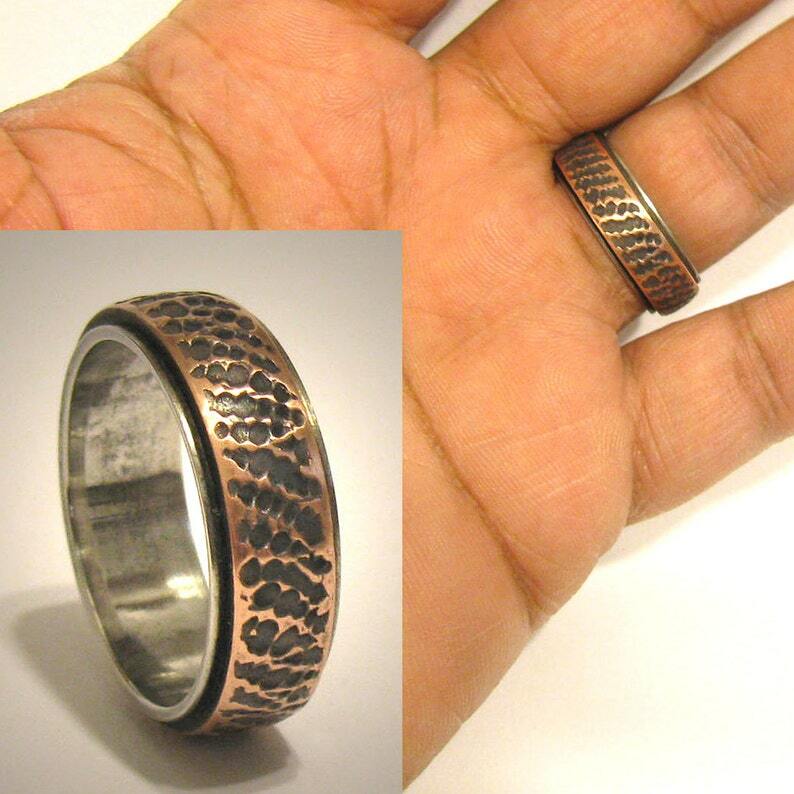 After receiving it, you can send me pictures of it on your ring finger. This greatly reduces the need for resizing. If needed, sizing *UP ONLY* is available for $25. Please allow 1-2 weeks to create your custom ring. In season, it could take longer. Be sure to check my store announcement for production times. If you need your ring in a rush, please inquire if it's possible, the costs, and best method for shipping. Please view my shop policies, and feel free to message me with any questions you may have about your custom ring. Quick easy transaction. The ring sizer is perfect. Simple to use. I would do business with DougDesigns again and again. awesome ring - so many compliments - wearing it every day!!! Exactly as described! Thank you! I accept all credit cards through Etsy Direct Checkout. Florida residents will be charged 7% sales tax. I want you to be absolutely satisfied with your order. 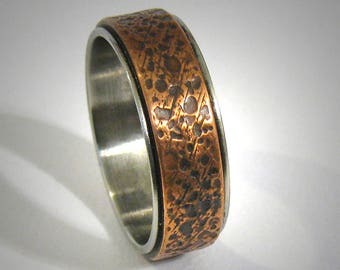 Wedding Bands - Since they are made to order, they are not returnable. Please contact me and I will do my best to remedy the situation. All other items - If you are unhappy with your purchase, please contact me within 3 days of receipt so we can discuss a resolution. RETURNS - After contacting me, if we have come to an agreement that your Item needs to be returned, you will receive a return authorization number. Please include it along with your Etsy receipt, and ship it with insurance and tracking. I am not responsible for items lost or damaged in transit. Items in the US must be returned within 10 days of receiving authorization. International items must be returned within 3 weeks of receiving authorization. All wedding bands come in a ring box. All other jewelry comes in a craft jewelry box ready for gift giving. Domestic orders are shipped by USPS First Class Mail with tracking, unless otherwise requested. Insurance is optional. Domestic orders above $200 are shipped Insured Priority Mail. Items above $400 will require a signature. For some countries..it may be possible for your order to be tracked online. Simply click on the tracking # to find out. If it is possible, you could also sign up for email updates on the shipping progress of your order. Priority International Mail (typically 6-10 business days, but not guaranteed) - Please contact me for rates. Express International Mail 3-5 business days - Please contact me for rates. ***Often international shipments are held at your local post office for pickup (not just dropped at your doorstep), so PLEASE be sure to check there if you are waiting on your order, they may not leave you a note. ****CUSTOMS - Please be aware that your country may charge Custom's duty, taxes, and other handling fees. These are your responsibility. *I am not responsible for items lost, stolen or misdirected mail. It is your responsibility to make sure that your address is correct, and that you request insurance. Shipping fees and rush order upgrades are nonrefundable. Prices may change without notice due to the daily fluctuation in the precious metals market. Caring for your Sterling Silver - Tarnishing of silver is the natural process of wearing Jewelry. Our bodies produce natural acids and in some people its stronger then others, so tarnishing may vary. Use a jewelry polish cloth to brighten items. 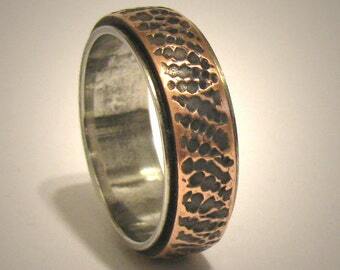 Caring for your Non Precious Metals - Brass, bronze and copper will tarnish in time. They can be cleaned with a jewelry polish cloth or metal polish.